Our test lab had already hosted wireless routers that support the draft of IEEE 802.11ac standard made by other vendors. 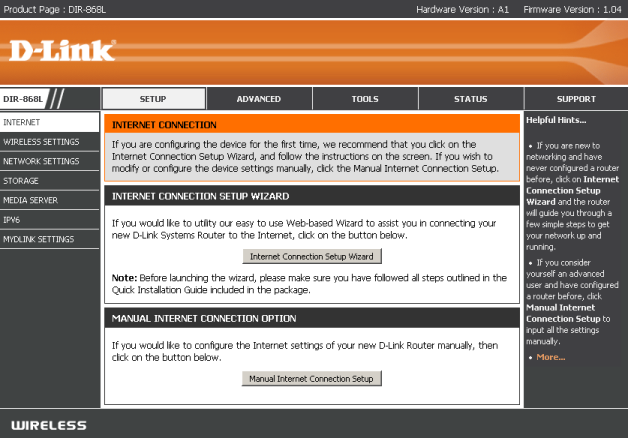 Now it's time to review this kind of device developed by D-Link. For some reason support of 802.11ac appeared in their devices slightly later. Let's see what it turned out to be. DIR-868L wireless router comes in a plastic case made of glossy and matte plastic. The device is tube-shaped and looks somewhat like a coffee grinder. 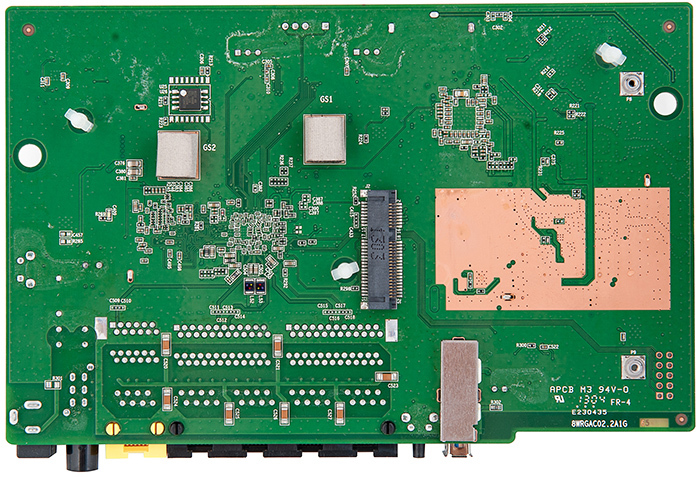 We already saw a similar kind of case body in, for instance, D-Link DIR-645. The device dimensions are 218x125x103 mm and to work properly it needs an external power unit (included in the box) with the following characteristics: 12V and 2.5А. The router upper panel has a small ventilation grate and the model name located on it. On the bottom of the device there are also a ventilation grate as well as rubber legs used for desktop mounting, sunken Reset button, and sticker with brief information about the device. 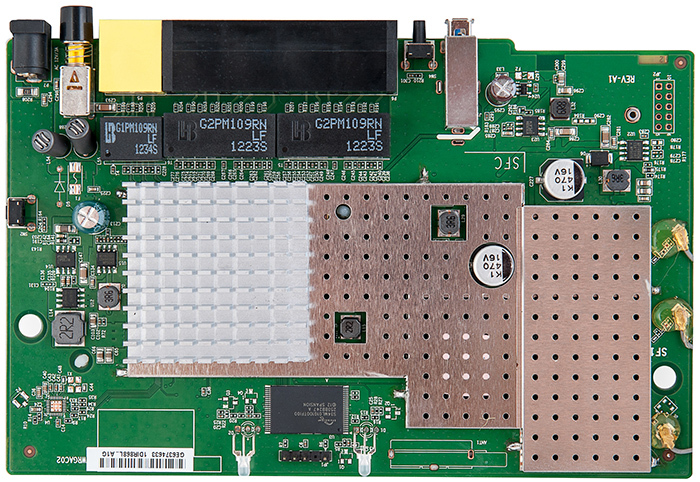 The front panel has two LEDs: indicating power supply of the device and availability of WAN connection. On the rear panel of the device there are power socket with ON/OFF button, USB 3.0 port, WPS button used for facilitation of wireless client connection, four LAN Gigabit Ethernet ports, and a WAN port which also has support of Gigabit Ethernet. Located just by the rear panel on the sides there are two 3D brand tags. Now let's have a look at the insides of the case. 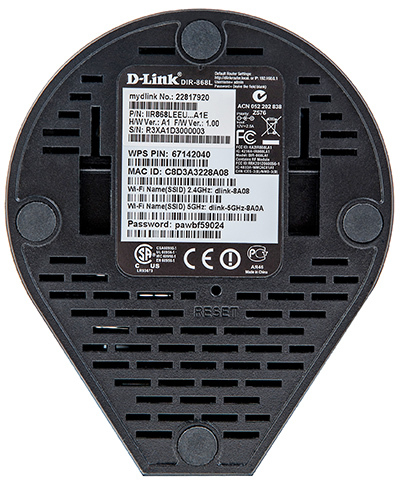 The hardware platform of D-Link DIR-868L wireless router consists of two green textolite cards; one of them has antennae glued into the plastic part of its case and connected to it. The great part of the cards is covered with radiators and screens. Only two chips are accessible for review. 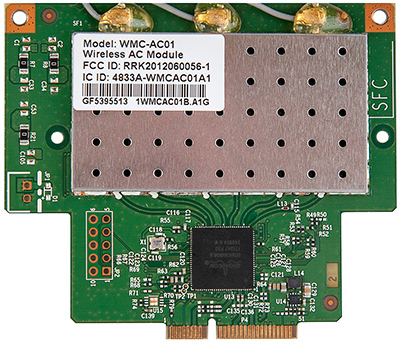 Broadcom BCM4360 micro chip—which is located on WMC-AC01 wireless module card —is charged with support functions of 802.11ac wireless segment. 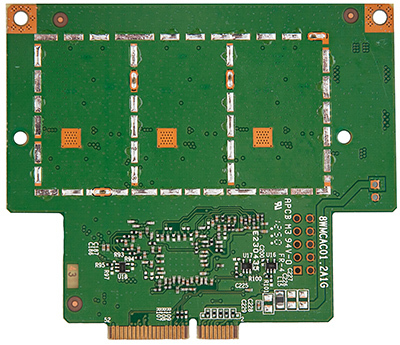 The second micro chip located on the main board is Spansion S34ML01G100TF100 flash card with memory capacity of 128 Mbytes. Now let's pass on to reviewing the software capabilities of the device. Once the router has been connected to the network, one will need to carry out all necessary getting ready procedures. To do that the administrator needs to enter 192.168.0.1 using any modern browser and adjust essential operation settings of the device via a single-purpose wizard. The wizard is available in 23 languages. However not necessary, we recommend all users to upgrade the router firmware. One can do this in TOOLS-FIRMWARE menu item. The procedure can be performed in two modes: manual and semi-automatic. 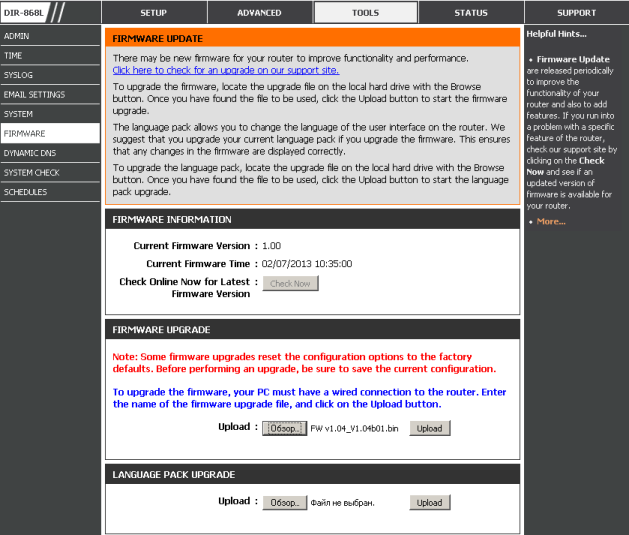 In order to upgrade the firmware manually a user will need to download the firmware upgrade file from the vendor's website and then upload it to the device. In case if semi-automatic mode is used, one will only need to have the device connected to the WAN. Apart from the firmware upgrade feature, TOOLS-FIRMWARE menu item allows the administrator to upload new language packs to the device. Unfortunately, when the article was being written there were still no language packs available. One can access the device using any modern browser just by entering 192.168.0.1 IP address. To log in an administrator must specify the login and password (blank by default). 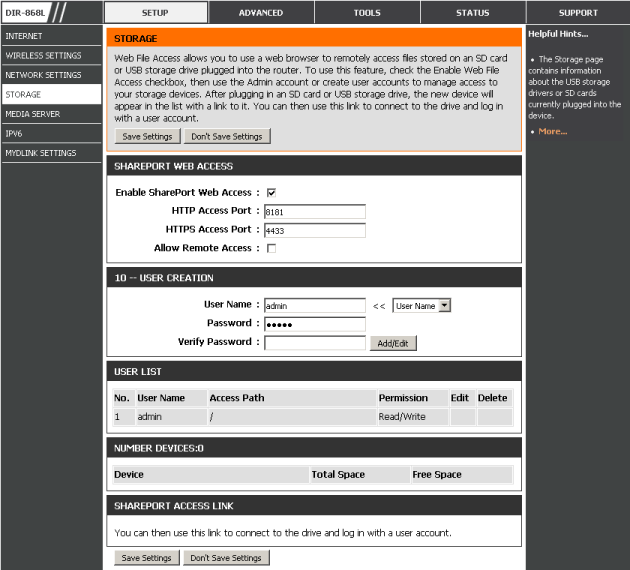 Upon successful authentication the administrator will find him/herself on SETUP-INTERNET page where s/he can adjust the WAN connection parameters both manually and using the wizard. When connecting to the service provider, the user can choose the following modes: static or dynamic IP adressing, PPPoE, PPTP, L2TP, as well as DS-Lite which uses IPv6. The web-interface functionality is similar to the one we already saw in other wireless routers by D-Link—for instance, in DIR-857—and therefore we will not review everything in detail, but focus on the most interesting capabilities of the tested model. 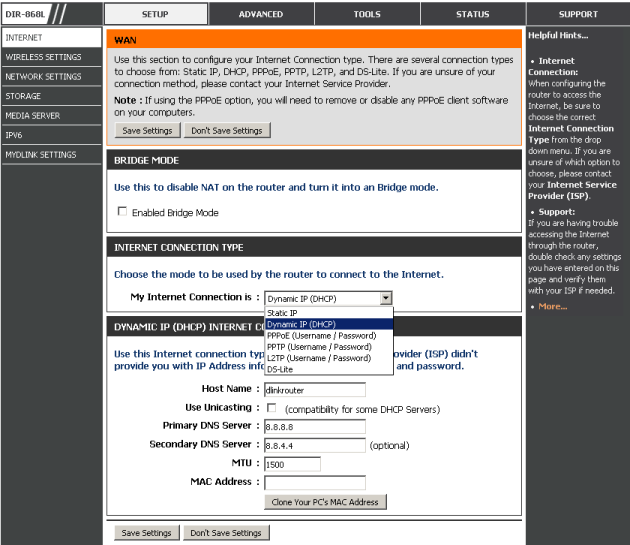 For example, DIR-868L allows for switching between LAN and WAN ports (Enable Bridge Mode feature). 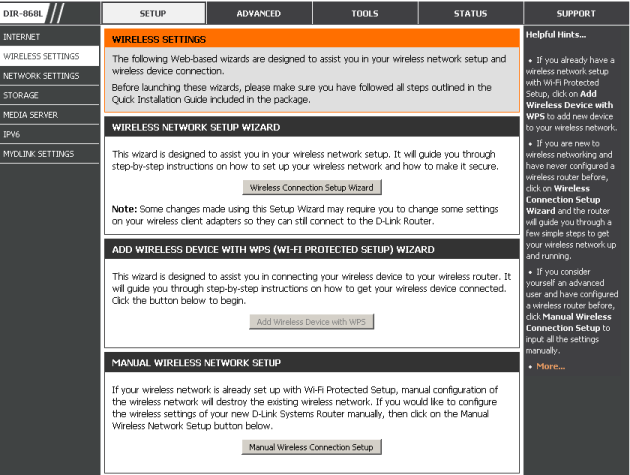 SETUP-WIRELESS SETTINGS menu item offers the administrator to adjust operation parameters of the wireless segment manually or in wizard mode. 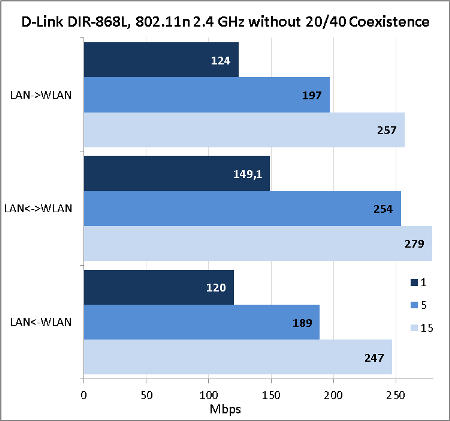 DIR-868L is the first router produced by D-Link with support of 802.11ac standard draft that we test. 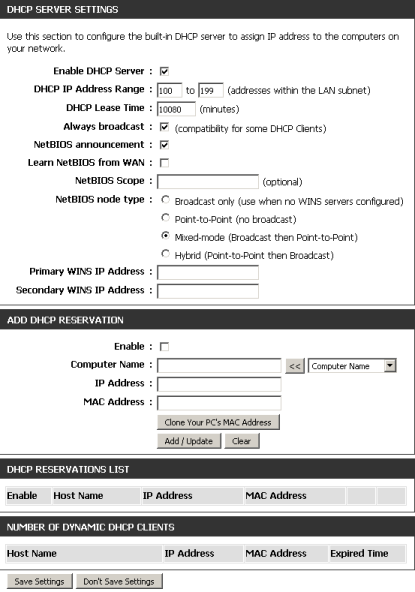 Among other things, SETUP-WIRELESS SETTINGS menu item allows one to perform flexible adjustment—aimed mainly at NETBIOS support—of the DHCP server. The user can access the data stored on a USB data carrier connected to DIR-868L not only using NETBIOS, but also via HTTP/HTTPS. The applicable settings are located in SETUP-STORAGE menu item. DLNA and iTunes server settings are located in SETUP-MEDIA SERVER menu item. Also, one can enable or disable USB 3.0 support over here. USB 3.0 disabling may be necessary in case if the IEEE 802.11 standard wireless network has degraded because of poorly shielded cables and connected devices, leading to noise in 2.4 and 5.0 GHz frequency ranges upon operation through USB 3.0. It'd be fair to mention that disabling of the USB 3.0 resulted in complete switching off of the USB port; in other words, this feature doesn't just switch the USB interface to 2.0 version support. It cuts it off instead. 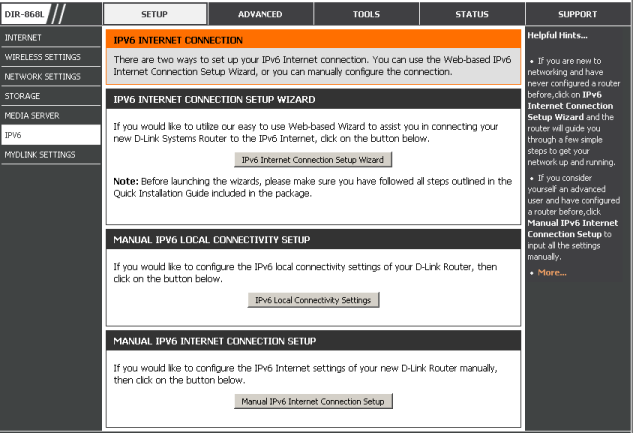 Management of IPv6 support is performed in SETUP-IPV6 menu item in both the manual and semi-automatic modes. 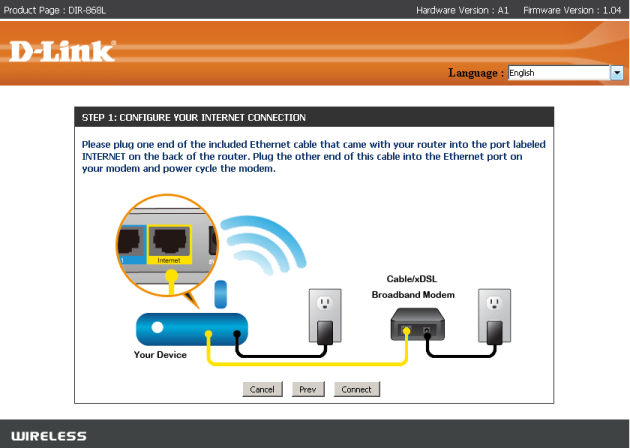 Upon registration of the router in mydlink service one can manage it not only using a local PC or notebook but also a remote computer or mobile device. The administrator can set the priority of this or that application and queue it or set the speed limitation according to the app queue using ADVANCED QOS ENGINE menu item. Running ahead of the story, we would like to mention that the peak routing performance with NAT upon enabled QoS was about 300 Mbps. 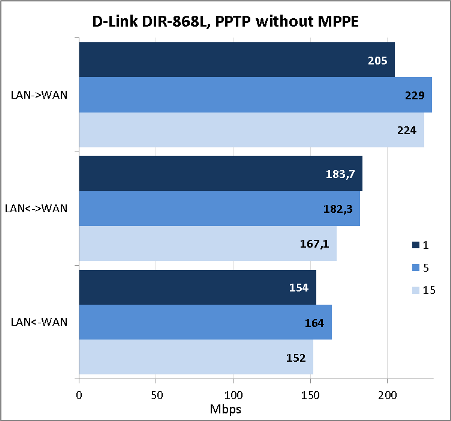 D-Link DIR-868L wireless router lets you filter traffic according to MAC and IP addresses and domain names; in addition to it, apart from the conventional SPI (Stateful Packet Inspection) mechanism, users are offered an anti-spoof filter that blocks packets from alleged fake senders. One can only identify whether it's fake or not when, for example, the packet from the LAN IP-addresses entered the router from the WAN interface. 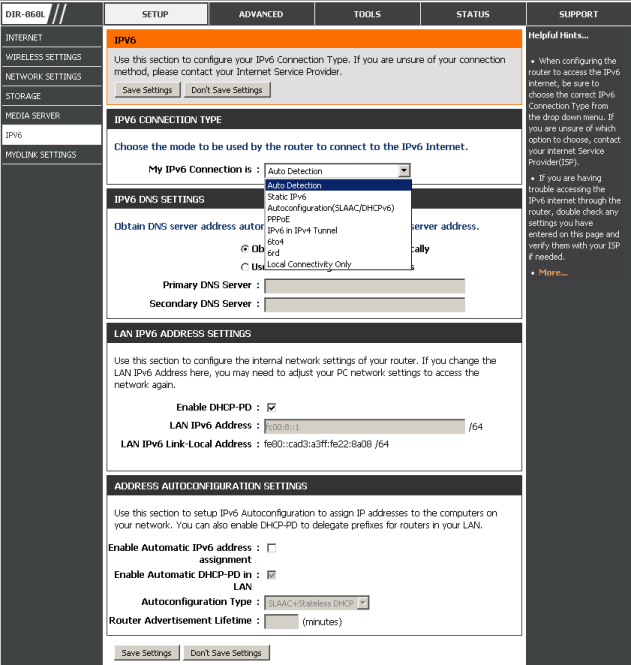 Corresponding settings can be applied in ADVANCED-FIREWALL SETTINGS menu item. Also, the administrator can manage ALG (Application Level Gateway) mechanism over here. It processes the following protocols: PPTP, IPSec, RTSP, and SIP. 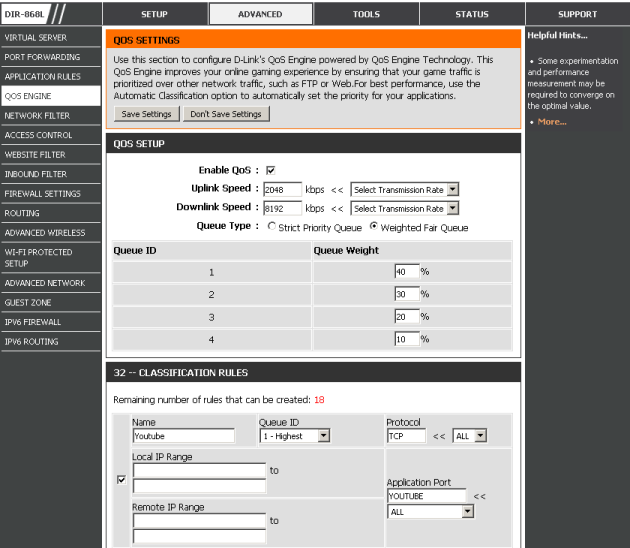 The other router settings are located in NETWORK FILTER, ACCESS CONTROL, WEBSITE FILTER, INBOUND FILTER, IPV6 FIREWALL groups, ADVANCED menu. 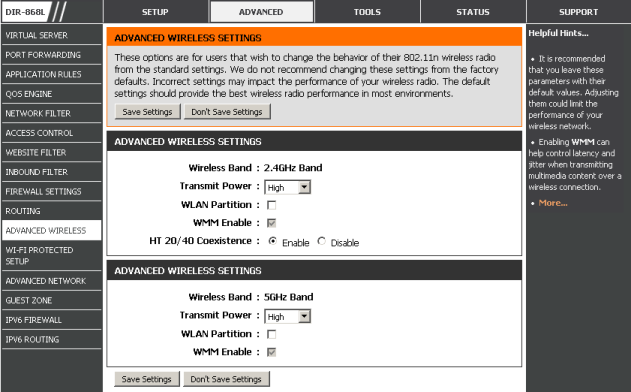 ADVANCED-ADVANCED WIRELESS menu item allows the administrator to select the wireless transmitter power efficiency and specify whether wireless users can be granted access to the data stored in the local wired segment or not. Apart from conventional wireless networks, DIR-868L also has a capability of establishing guest SSID networks. Corresponding settings are available in ADVANCED-GUEST ZONE menu items. 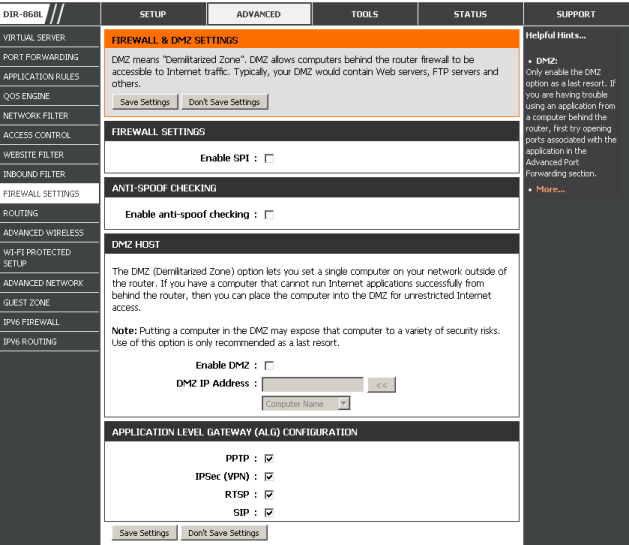 Using TOOLS-SYSTEM CHECK menu item, if it's necessary, the user can check the network connectivity by sending ICMP echo requests using IPv4 and/or IPv6. 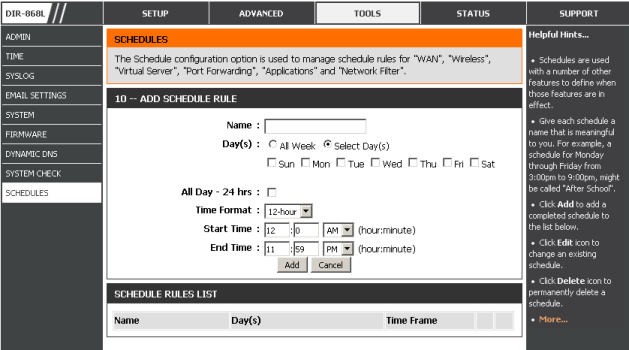 By using TOOLS-SCHEDULES menu item the administrator can add schedule rules according to which various features of the device may be enabled or disabled at a certain time. For example, one can disable the wireless network for the night. As a matter of course, schedule rules would function properly only in case if DIR-868L clock is synchronized with the NTP server over the Internet. Help notifications located on each page of the web-interface come in handy, too. They let users understand what this or that feature is used for without turning for help to the manual. That's where we proceed to completion of the brief review of D-Link DIR-868L wireless router web-interface capabilities and pass directly on to testing it. The first testing procedure we usually begin our testing section with is estimating the booting time of the device, which is a time interval starting with the moment when the power is on until the first echo reply is received through ICMP protocol. 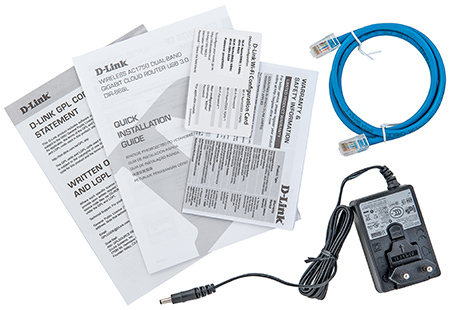 D-Link DIR-868L wireless router boots in 37 seconds. We believe that the result is decent. It was approximately the 8th second when we received several echo-replies with TTL=100. However, we are not counting them in since this was when only the loader answered; in other words, the device was not yet ready for fully-featured operation. The second test was a security scanning procedure, which has been carried out using Positive Technologies XSpider 7.7 (Demo build 3100) utility. On the whole, there were ten open ports discovered, and they are TCP-53 (DNS), UDP-53 (DNS), TCP-80 (HTTP), TCP-443 (HTTP SSL), TCP-4433 (HTTP SSL), TCP-5449 (unknown), TCP-8181 (HTTP), TCP-8182 (HTTP), TCP-49152 (HTTP), and TCP-63481 (unknown). The most interesting data are presented below. Before showing our readers the performance test results, we would like to mention key specifications of the test stand we used. The first performance test we carried out was identifying the routing speed upon NAT translation. 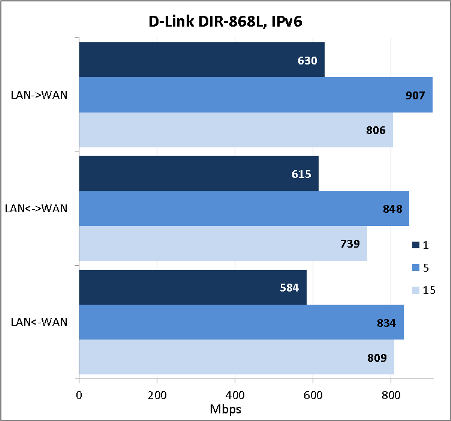 Since D-Link DIR-868L wireless router supports IPv6, we just couldn't help but review this feature by measuring the device performance upon operation with IPv6. No NAT translation was performed while we did it. One of the most sought-for capabilities for majority of users from Russia and the CIS is support of PPTP, PPPoE, and L2TP tunnelling. We decided to find out what the speed will be upon user data transferring through PPTP. 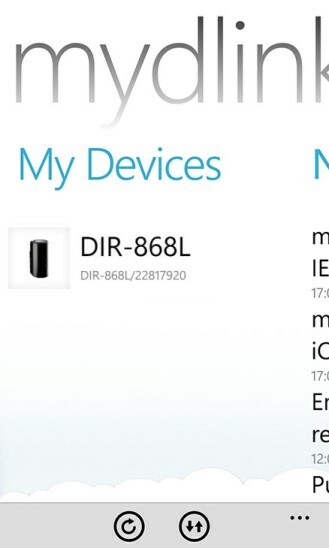 D-Link DIR-868L doesn't support encryption of data transferred through a tunnel. 20/40 Coexistence feature—allowing wireless clients to work simultaneously with both 20MHz and 40MHz channel bandwidth—significantly affects the wireless segment performance upon operation within the 2.4 GHz frequency range. 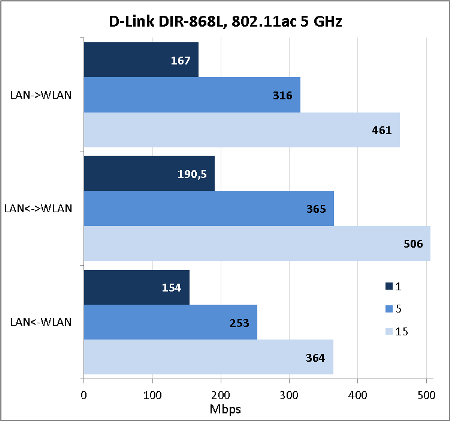 D-Link DIR-868L wireless router supports 802.11ac draft in 5 GHz frequency range. As a matter of course, we couldn't help but review this capability. 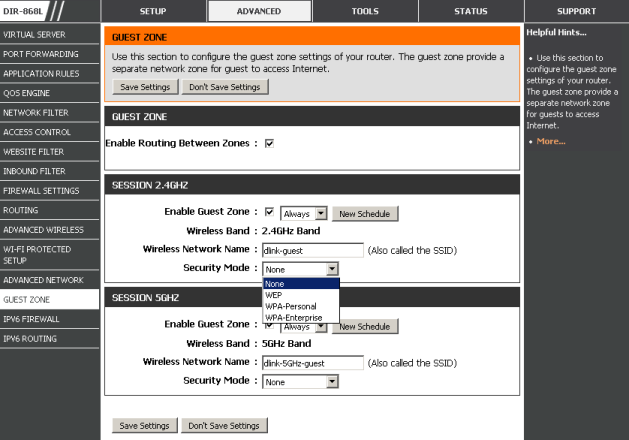 ASUS RT-AC66U router, which we already reviewed before, was used as the client. Also, we decided to measure access speeds to the data stored on an external HDD connected via USB. In order to carry out this test we used 750 GB Transcend StoreJet 25M3 external data carrier. Results of the measurements are presented on the diagram below. 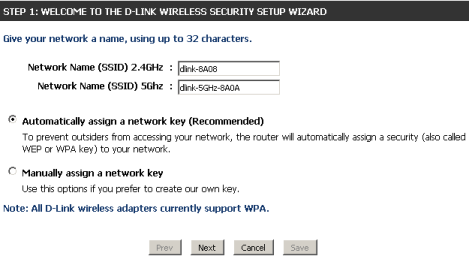 As of when this article was being written, the D-Link DIR-868L wireless router firmware on an external HDD supported only FAT16/32 and NTFS, having no EXT2 or EXT3 support. 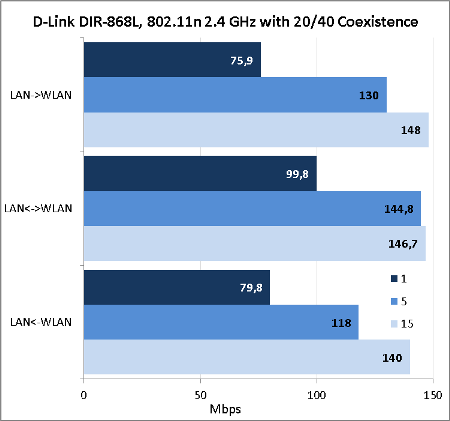 Generally, we are glad about D-Link DIR-868L wireless router we tested. 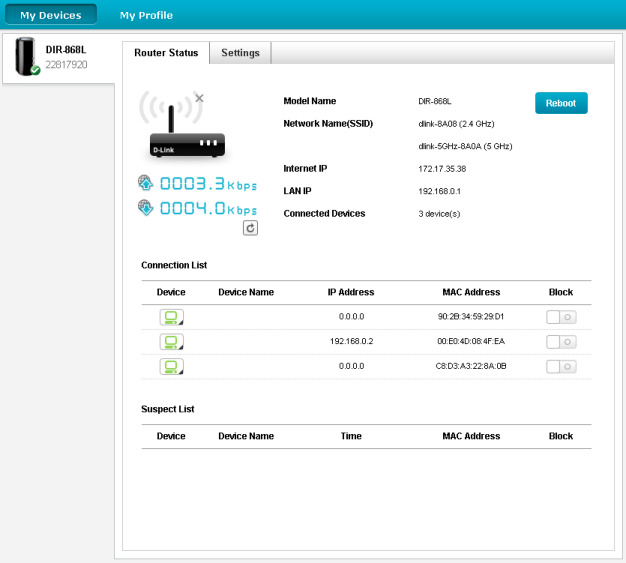 Eventually, D-Link is on with a long anticipated device which supports 802.11ac draft. 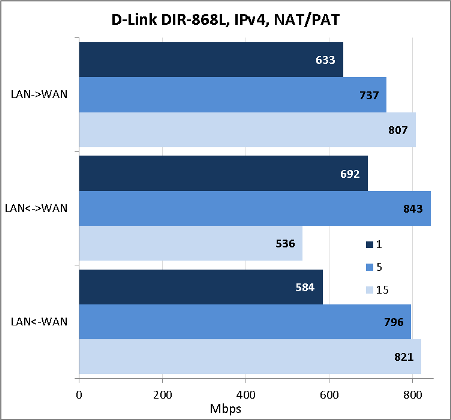 We were pleasantly surprised at the router performance upon operation with IPv6. Unfortunately, there were also drawbacks we discovered. Among the shortcomings of device are the following. 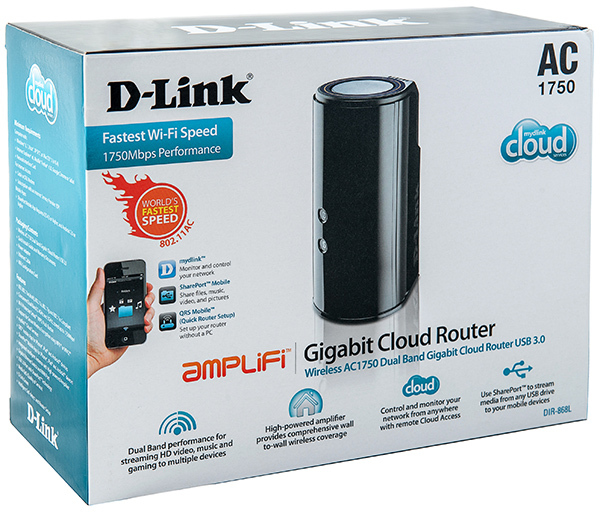 As of when this article was being written, D-Link DIR-868L router just landed on the shelves of Moscow online shops for the average price of 6400 roubles. The price may drop once the device will be sold massively.